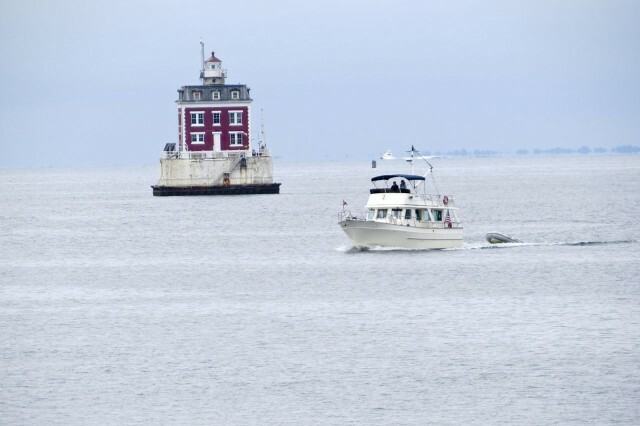 Ten months ago, we brought our 2003 Mariner Orient 38 home from the Chesapeake Bay after we closed on July 25, 2014. We enjoyed her on the water for about 9 weeks and began our adjustment to life without sails. On September 26th the boat was hauled out for her winter hibernation in Portland, CT, about 15 minutes from our home. Thank goodness she was close to home because Al was there several days working on her each week. The past eight months were spent transforming this trawler into our boat. 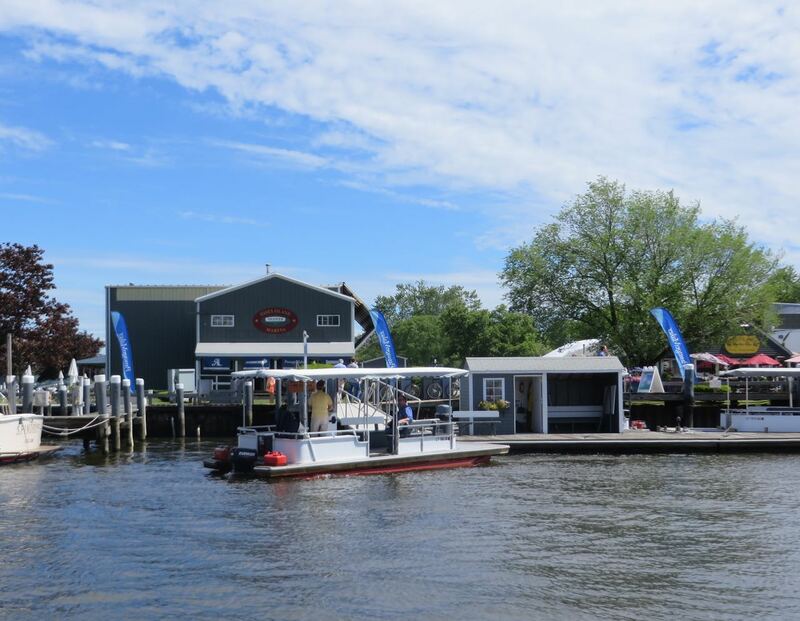 We have been through this process before as documented in this blog (50+ Years of Boats.) Al loves working on boats, and I certainly enjoy the fruits of his labors. 2003 — Wow! We never imagined we would own a boat built in this century! We both love boating, together. We needed a boat that would see us into our golden years, and be easier to handle. We want to travel south again and have another adventure. We have a limited number of years remaining to enjoy this together. I have kept detailed records of every dollar spent on this transformation. Al fondly recalls the old pre-retirement days when he could do his boat projects without someone (me) recording the cost of everything. It has actually been quite interesting. We could never, ever attempt this without Al’s talents. Of all the projects and changes on this boat, only a few were done by someone else – the bimini and salon cushions, welding the handrails, and the transmission repair. In addition to Al’s expertise and creativity, he is also a master at finding the best deals on materials and equipment. Our biggest concern was that steep ladder to the flybridge. “1st Law of Boat Projects: No single project can be accomplished without creating two or three new projects. Corollary To First Law Of Boat Projects: The more complicated the original project, the more new projects it will spawn. As we walked over to Essex Island Marina we glanced over at the next boatyard. Sure enough, our old Tanzer 26 is still sitting there “on the hard,” for the past 21 years. Yes, it has been 21 years since we traded that boat (we only owned it for a very short time and never really used it) for an Irwin 37. 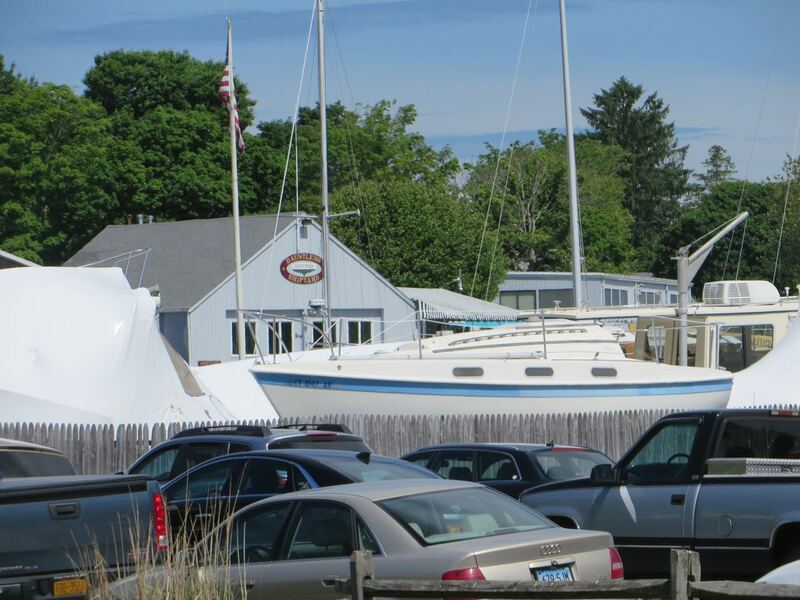 For that story, take a look at 50+ Years of Boats. Essex Island Marina is separated from Essex by a channel, so a little ferry takes you across. Trawlers – big ones and small ones, 26 feet all the way up to 56 feet. The prices spanned an even greater range from around $100,000 to well over $1,500,000. 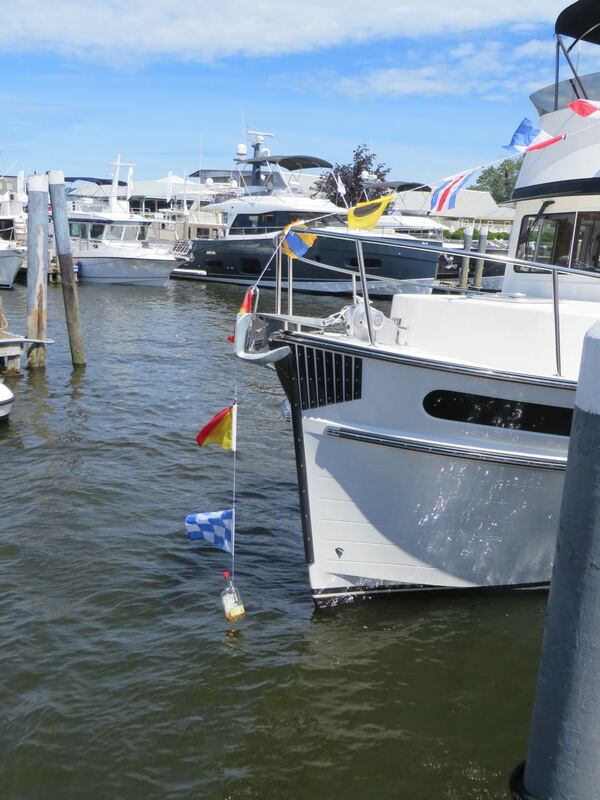 This is one way to dress a boat with signal flags and weigh them down. But would you really leave the whiskey in the bottle? 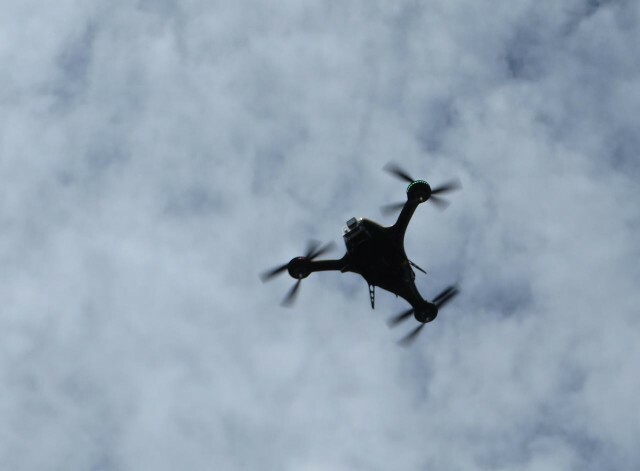 Over our heads, a drone with a go-pro camera flew above. I am not really comfortable about these things flying over my head. We stopped at a booth labeled “MTOA.” Truthfully, we were called over to it as we passed by a small group of very friendly and gregarious people. 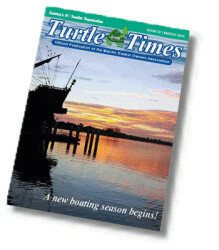 MTOA is the acronym for Marine Trawler Owners Association. 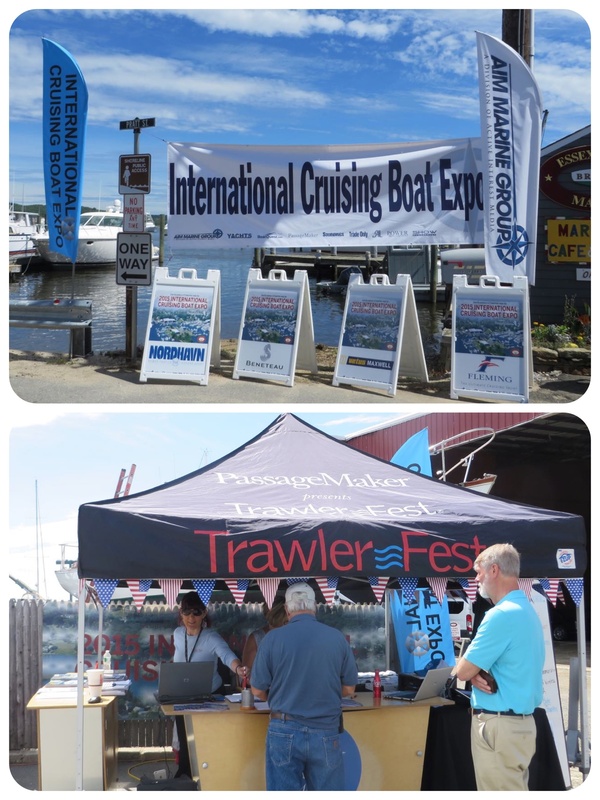 The group was originally founded as a Marine Trader (a specific make of trawler) Owner Association in 1990, but it has morphed into a more inclusive organization, embracing all types of trawlers, as well as some sailboats and fishing boats. Membership now numbers 2000 active members, 1000 boats and 40 different states. The group is “not about a specific brand of boat; it’s about friendships, rendezvous, cruising and ‘messing’ around in boats.” That philosophy certainly sounded like a match for us, so we decided to give it a try. Turtles everywhere! 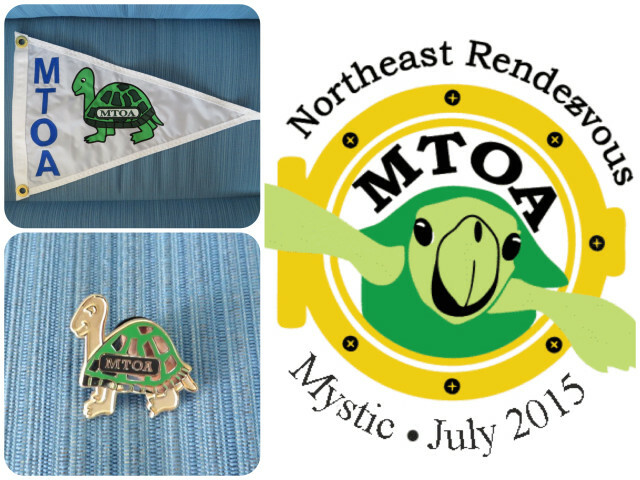 Our new MTOA burgee, one of the MTOA pins, and the logo for the Northeast Rendezvous in mystic this summer. What are our thoughts on the Trawler Fest? It was a nice day, it was nice to see boats, especially trawlers; but…. there were two big negatives. First, the seminars cost $50 each, but did include the entrance fee of $15, if you registered early. Some of them looked worthwhile, but that seemed to be an excessive additional cost. 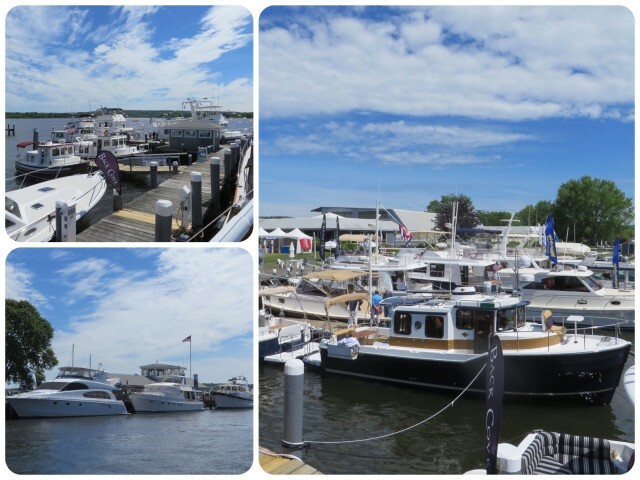 Most of the boat shows we have attended in the past included the seminars in the ticket price. Second, there were very few vendor booths compared to Newport. Final conclusion? We walked away from all of those shiny new trawlers, feeling very happy with our little Mariner Orient 38. This entry was posted in Transforming the Trawler, Transitioning from Sail to Trawler by watsons. Bookmark the permalink.